During our Learning & Achieving Through the Arts winter session, students had the unique opportunity to collaborate not only with different schools, but also across different studios! Teaching artists Matt Bogdanow, Sadie Yarrington, and Kristy Messer, envisioned a three-art form collaboration between Digital Music, Dance, and Filmmaking. 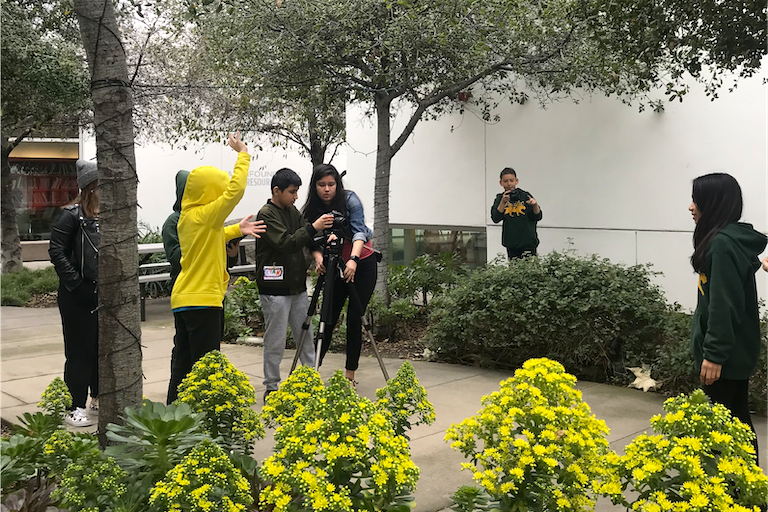 Over three weeks, sixth graders from Aspire Centennial College Preparatory Academy and seventh graders from Aspire Pacific Academy collaborated with one other to choreograph, shoot, produce, and perform their own music videos. That feeling when, after five takes, the last one goes seamlessly. ✨ A three art form collaboration project. Digital Music Production students created the beats, Dance students choreographed and performed, and Film students shot the whole thing! In Digital Music Production, students created original tracks in small groups using Ableton Live. These tracks were sent to the dance studio where dancers chose the beats they connected with most and created choreography in teams. After the choreography was fully developed, the film studio separated into different film crews to direct and film dancers in a variety of locations across campus. Film students then edited the videos that were presented at our final showcase!